We seem to be choosing stories about mothers and children lately and The Ugly Duckling is no exception. However, my first thoughts on reading it again were not about mothers, but about belonging and not belonging. Re-calling Clarissa Pinkola Estes’ phrase “the mistaken zygote,” I went back to my well-thumbed beloved copy of Women Who Run With the Wolves. Let me digress a moment here and say this book ought to be every woman’s Bible. If I were in charge (!) I would make sure every girl gets one as part of a coming-of-age package presented at the celebration of menarche. Of course I ended up re-reading the whole chapter, smiling and crying a bit to see the condition of being female so beautifully understood. Buy it, steal it, borrow it and refuse to return it! Get your hands on a copy and keep it close at hand. It is a psychological and spiritual root story. A root story is one that contains a truth so fundamental to human development that without integration of this fact further progression is shaky, and one cannot entirely prosper psychologically until this point is reached. The other important aspect of the story is that when an individual’s particular kind of soulfulness, which is both an instinctual and a spiritual identity, is surrounded by psychic acknowledgment and acceptance, that person feels life and power as never before. Ascertaining one’s own psychic family brings a person vitality and belongingness. I loved this story the very first time I read it. Then, I got to see Danny Kaye play Hans Christian Anderson in the movies! At age seven, I developed a mad crush on him, learned his songs by heart, and saw every movie of his my parents allowed. I still sing, “Quack! Get out! Quack! Quack! Get out! Quack! Quack! Get out of town!” to myself some days. The Ugly Duckling gave me a sense of self-worth. It inspired me to keep looking for my “pack” and gave me the courage to approach them whenever I did find another pack member. I was very happy to return to the story after all theses years, read it again and find it as edifying and useful as ever. I still feel heartstruck at the exile of the duckling, proving that old scars never completely fade away. Perhaps that’s why the tones in this collage are so dark – not something I intended. All Anderson’s stories are tinged with shadows, even those with happy endings. I suppose it’s why I love them so. They never prevaricate or pretend. As a child, nothing was more frightening to me than lies. I could always trust Mr. Anderson to truthfully reflected the uneven mixture of pain, grief, joy and happiness I found life to be. 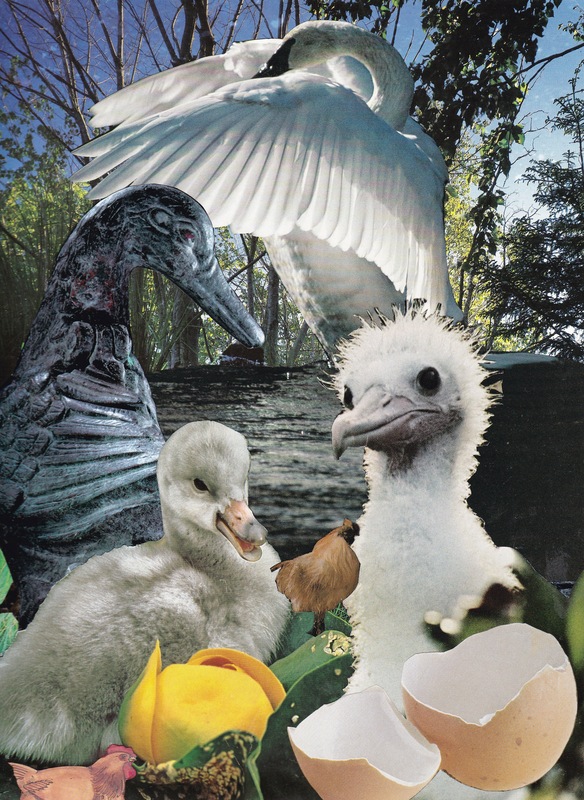 My collage shows the mother duck with both her own duckling and the strange creature she has inadvertently hatched. The chickens and cat represent barnyard fowl, the ignorant nay-sayers of this world. I included the cat because it foreshadows the danger the cygnet will meet on his quest. The swan, is his true nature; the creature he will find at journey’s end.